Chromium-6 in your Orange County Area water can cause serious health complications and even cancer, so it’s worth understanding more about where chromium-6 comes from, its health effects, how you can identify it in water, and how you can remove it if your water could be at risk. [pullquote]Chromium-6 can be especially harmful if it finds its way into the water system, because it can cause cancer and other serious complications over prolonged consumption in humans. [/pullquote] It specifically targets respiratory and digestive systems, produces kidney and liver damage, skin reactions, and has been known to cause cancers targeting those areas. It’s especially dangerous for those already vulnerable members of the population like young children, pregnant women, the elderly, and those with respiratory conditions like asthma. The most effective way to ensure chromium-6 is removed from your water supply is through either reverse osmosis filtration or sophisticated carbon and micron filtration. 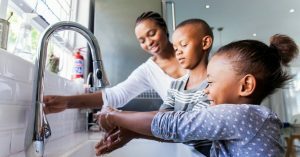 Culligan can make a recommendation about which of the styles of reverse osmosis filtration systems would make sense for your home, and help you understand how the chromium-6 removal process works. A Culligan Man will be able to help you find the best solution for your home’s specific needs, whether you have elevated chromium-6 levels, or something else affecting your water. Schedule your free water test online today to get started.